First, it is designed to disorientate the reader in Orwellian – or maybe Lewis Carroll – fashion, inverting the world of reality. The reader is primed for a disclosure, a secret, and then is spoonfed familiar government propaganda: that the tentacles of a Russian octopus are everywhere, that the Reds are again under our beds – or at least, poisoning our door handles. 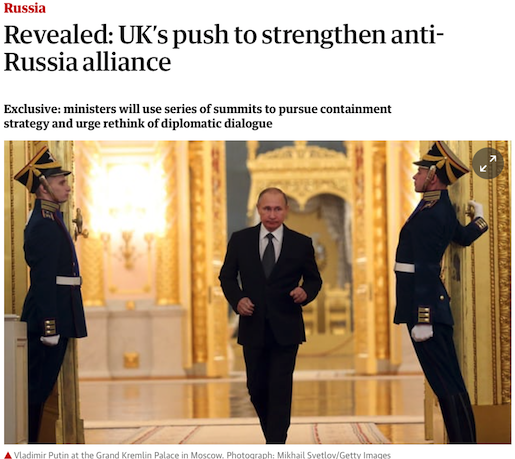 This article was posted on Saturday, May 5th, 2018 at 2:06pm and is filed under Disinformation, EU, Europe, Fake News, Middle East, President Vladimir Putin, Propaganda, Russia, Theresa May, UK Hypocrisy, UK Media, United Kingdom, United States.